It is finally done (and we mean it this time)! In the post that follows we will detail the logic that lead us to to this new paradigm for navigation stations, and the details that evolved. Most things to do with boats require compromises; lots of them. Nowhere is more true than when you start to work on the”perfect” helm or navigation area. 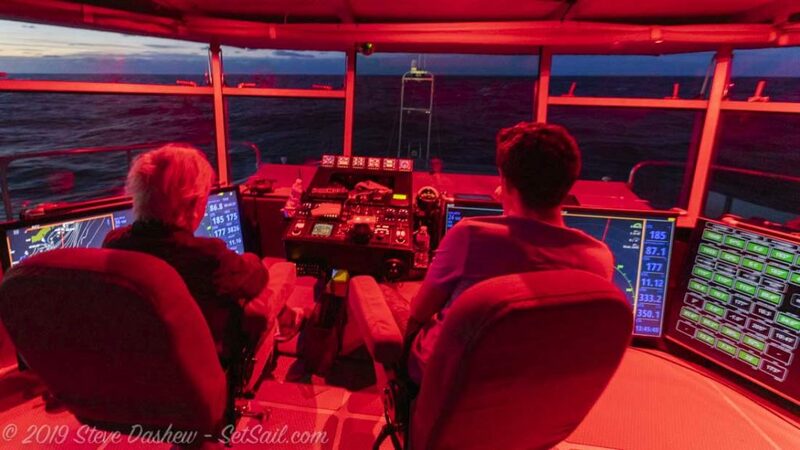 If you are working with a static layout of information the varying operational modes (inshore, on passage, day or night, good charts or feeling your way, good visibility or rain/fog) make it impossible to have the right presentation all of the time. In the olden days with less information, the options were fewer, and the answers simpler. But now we have so much data potentially available that information overload is a definite issue. 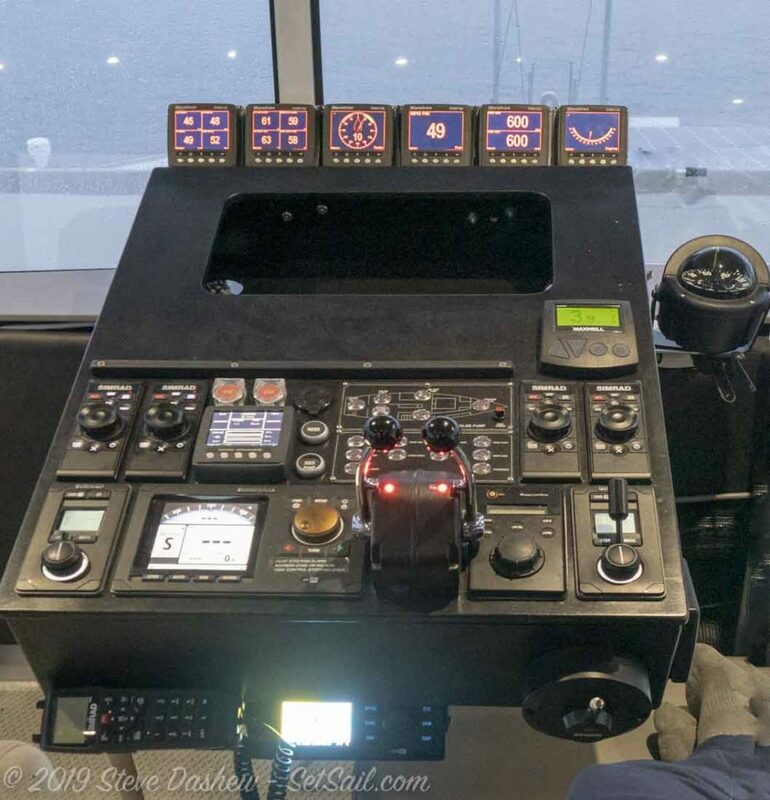 When you add up the features of an integrated nav system, multiple radars, depth sources, sonar, night vision cameras, video feeds, and N2K data, and then throw in a bit of stress and fatigue, it is easy to see where the sum of these parts can be a negative. On the other hand, if the data is displayed in a user friendly manner that works well in different situations the benefits are significant. 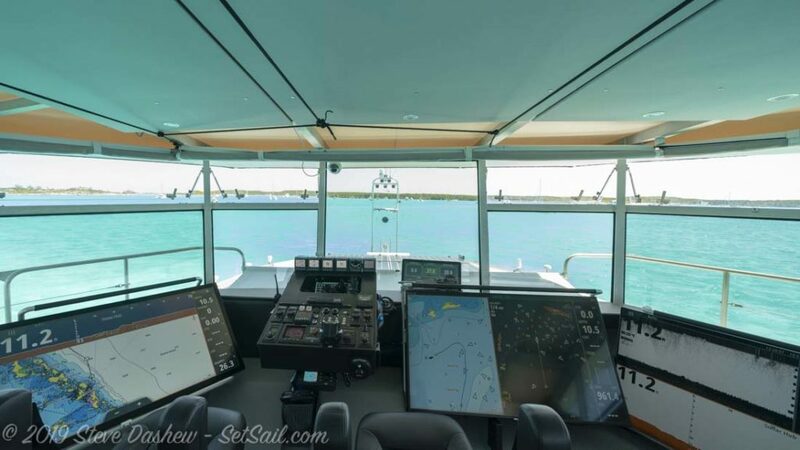 Moving from the very simplest approach – paper charts and celestial navigation at the start, to where we are today – we have been acutely aware of the downsides of this information revolution. We have seen ourselves make errors based on misinterpreting this more complex array of data; mistakes that would not have occurred with simpler methods. As designers we are always wary of decisions made by habit, choosing the same approach to a requirement because it has worked in the past. When we started to work on the Matrix deck for the FPB 78s we looked at this critical area as a development of what worked so well on the FPB 83 Wind Horse. This was habit. On Wind Horse (above), and the FPB 64s (below) the forward end of the great room was where we had the full array of electronics. If we were conning in an area requiring optimal visual observation as well as electronic info Linda would typically run the latter below and I would be above with the better sight lines. She would then feed the electronic info to me. Compared to what was considered state of the art with our sailing yachts the early FPBs were like sci-fi. 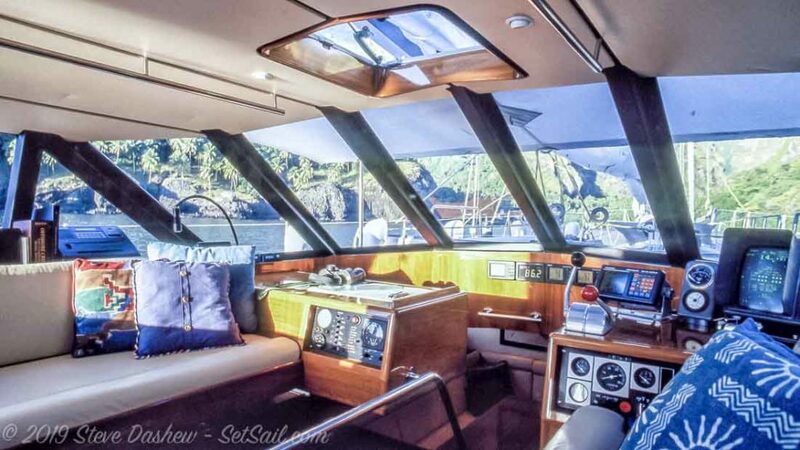 The 78’ Beowulf had the electronics inside of the small deck level pilot house. The efficiency, function, and joy of navigating from here was unsurpassed. Yet our FPB world took this to a totally new level. The FPB 97 Iceberg heralded the birth of the Matrix deck. With the weather protected space this created we were able to combine optimal view with all of the electronics. The multitude of monitors and processors made for a panoply of information. During the design cycle for the FPB 78s we looked at a variety of layouts for both the Matrix and great room levels. With Cochise we had a relatively simple approach to the Matrix level nav gear (Michael and Nancy Morrell on watch below). There was a single 32″ monitor supplemented with one or two tablets. 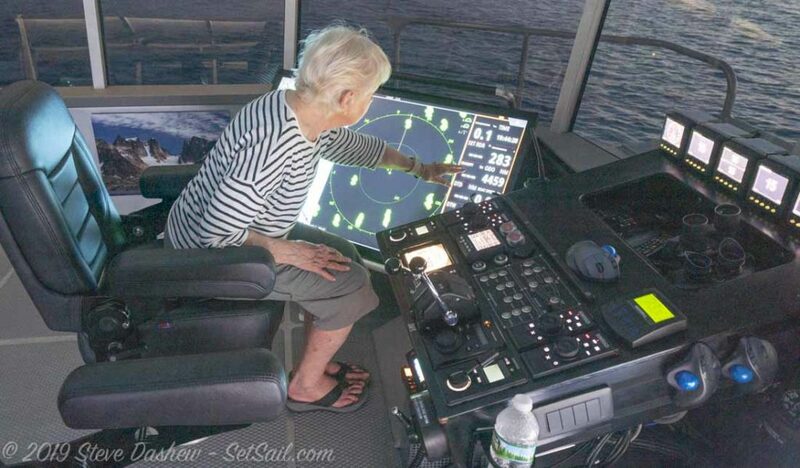 Nancy is using an 18″ Samsung Galaxy View as a chart plotter in the photo above. The nav desk stretched clear across the full width of the space. There was a notch to port that allowed us to get close to the windows if required. Compared to the FPB 64s and Wind Horse this approach was a major improvement. We did not think there was anything better around. During our passage uphill from French Polynesia to Panama we did a bit of experimenting in the great room. 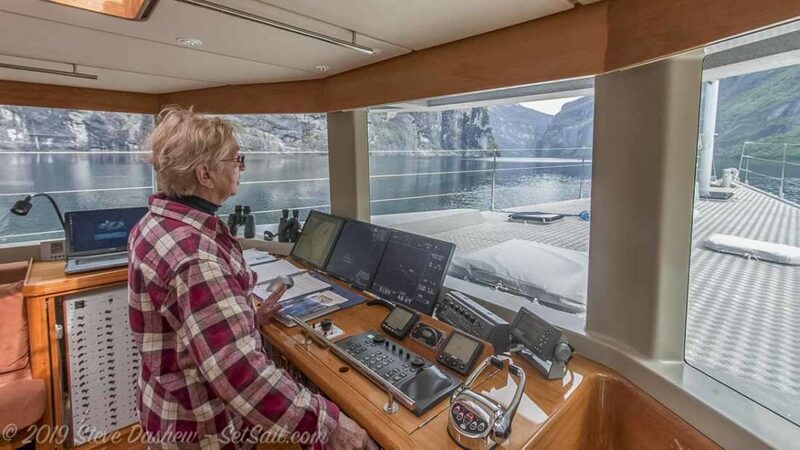 We switched the Simrad NSO2 processor output from a monitor on the nav desk to the big TV. We were pleasantly surprised by how well this worked. Included in the benefits was a reduction in window glare, the result of a vertical TV with an overhanging lip of furniture above it. It was a dark, rainy night working our way through a very narrow part of the ICW when we began to realize there might be a better approach to the instrumentation. The two of us are approaching extreme maturity and our night vision is deteriorating. We also no longer have the stamina to spend five or six hours standing on watch, noses pressed close to the forward windows, straining to see in rain and fog. As frequent Set Sail visitors will know this lead to the removal of our traditional bridge in search for something better. Normally changes of this magnitude in an existing boat are against our personal rules. 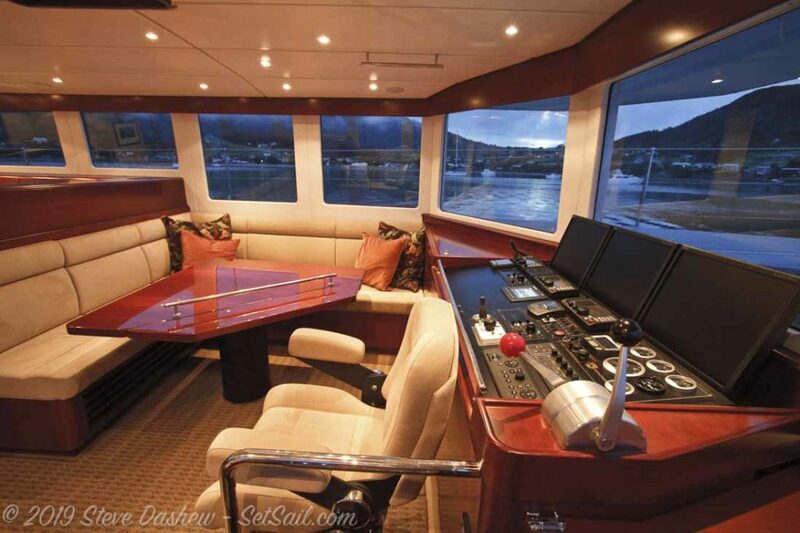 But as Cochise is our last big yacht, we felt an imperative to see if we could come up with an improved approach. Although Cochise surpassed our hopes motion wise, particularly up hill and at anchor in sloppy conditions, after 20,000+ miles aboard we felt there might be a slightly different approach to the distribution of mass that would yield an even more comfortable outcome. A series of factors came together in a most fortuitous manner. Take a good look at the photo above. Notice anything different? The long booms with which the FPB 78s began life are shorter, about half their original length. We found Cochise so comfortable at anchor that the flopper stoppers were rarely used Those original booms were optimized for roll control at anchor. With this no longer required why pay the weight and windage penalty? Reducing the length was a big gainer. This got us looking at what else could be improved in terms of enhancing the stability curve. It turns out there was a lot of which the biggest of all was making the Matrix level mods we have been discussing. Add in a modest change in how we positioned tools, ship’s stores, and spare parts and the sum of these three modifications was significant. One of the goals of this revision was to better isolate our data so it could be more easily assimilated. We have been back and forth over the past year with size, placement, and number of monitors. What you see here is the result of much experimentation. The process that has led to our eventual answer, seen in more detail above, has been long, difficult, costly, but also productive. When we started we thought we could make major improvements with a fairly simple revision. 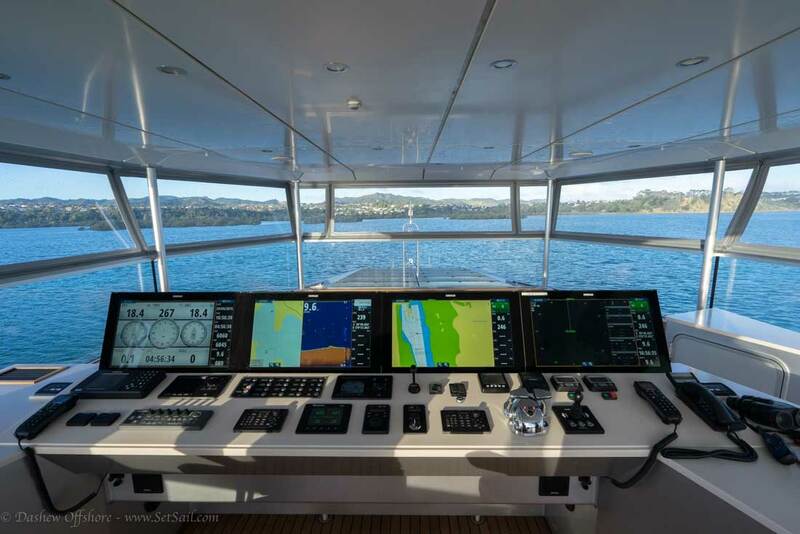 But each new version of the helm area opened our eyes to further possibilities. The benefits of these big screens is hard to overemphasize. The information almost jumps off the screen at us. When we are on soundings, and needing the clearest understanding we keep radar, chart, and depth related data isolated, each on its own screen. 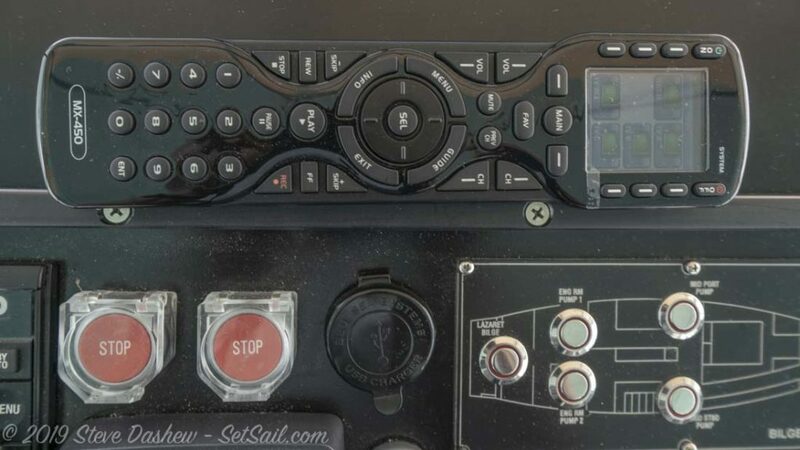 This means that any time we want to change something, radar range for example, we only need to turn a single dial on the Simrad OP50 controller. This is one or two keystrokes faster than if we had multiple windows open, and reduces the chances for making an error under stress. The monitors are hinged and can be rotated up for access behind. Each monitor has two operating positions; vertical at night to minimize the light reflected off the screens and onto the windows, and slightly angled, to make them easier to view when standing close by. Daytime glare from low sun angles is significantly reduced by the combination of low placement and near vertical angle. We have seen no situation in which the TV screens could not be easily read. 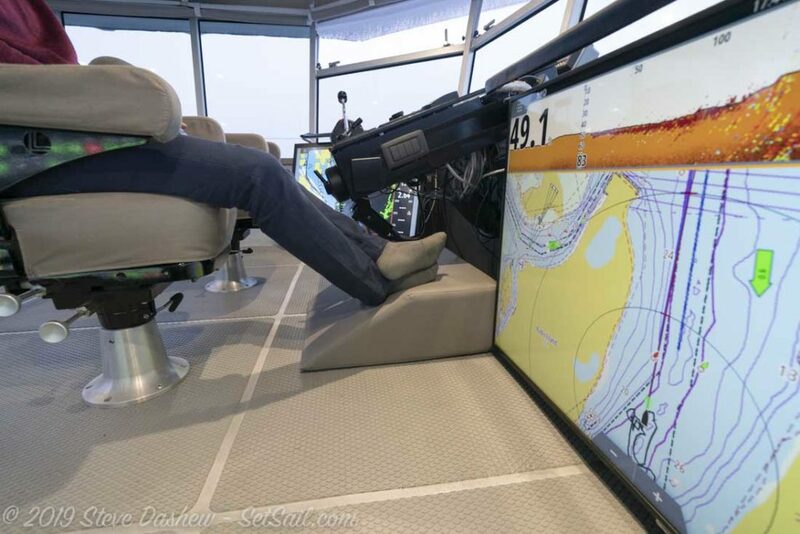 The port monitor is a 49” touch screen that can be comfortably reached from the nearby helm chair. While we are not big fans of smaller touch screens offshore this large scale touch screen works really well for many tasks. 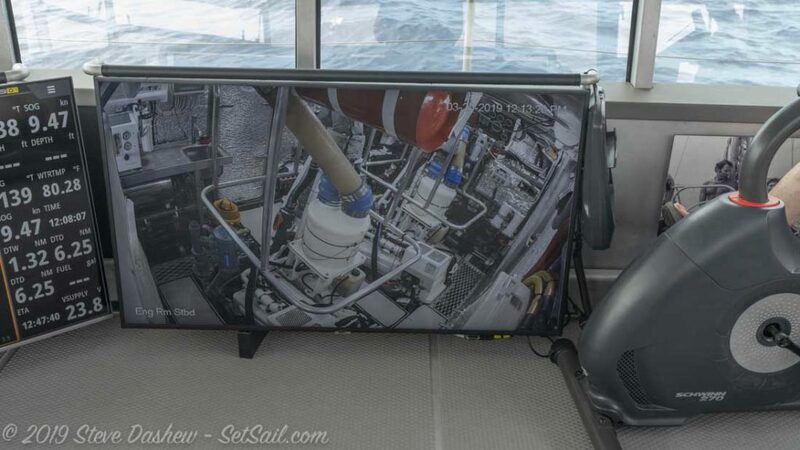 There are three Samsung 55″ TVs on the starboard side. The data array here is oriented towards offshore passage making. 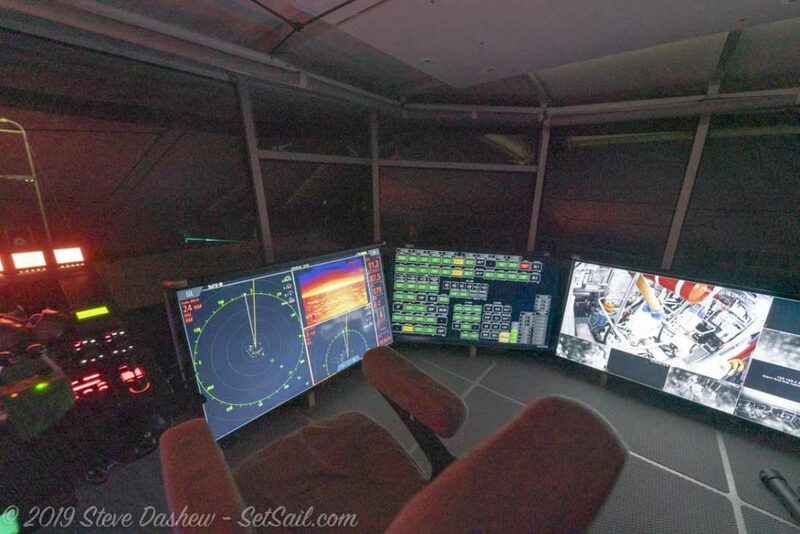 The aft TV (right side of the photo) has a view of the engine room, with access to other views by mouse. The diagonal screen shows our N2K system data. And the screen closest to the console is showing radar in two windows and the FLIR night vision camera in the third. All four of the monitors are controlled with a single remote (stored horizontally at the top of the photo). We turn them on/off, dim them, and change source with this handy little device. The new Matrix deck is easily moded to the best layout for each set of conditions. Here we are set up for thin water navigation in the Bahamas. 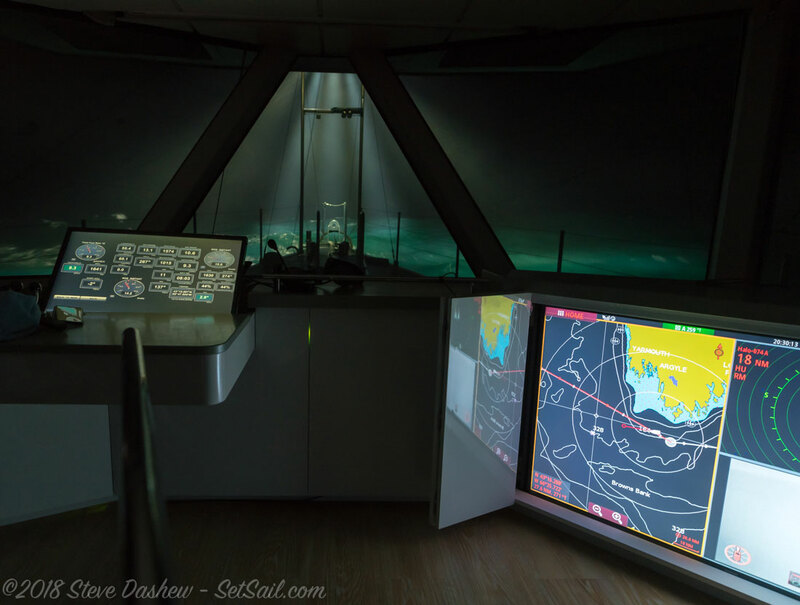 The screen adjacent to the console is split between radar and chart plotter. 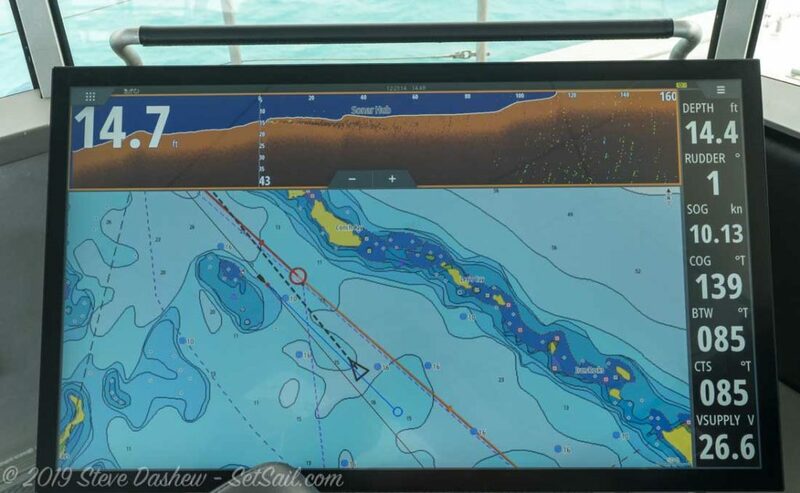 The diagonal screen has three depth sources made up from Simrad’s Structure Scan, Forward Looking Sonar, and a simple depth trend. The video input on the aft TV has been switched to external view cameras. 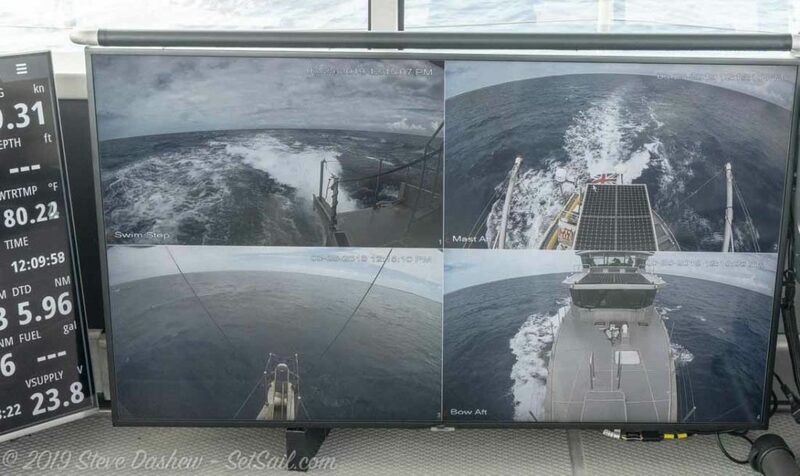 In most situations the video camera system is focused on the engine room when we are offshore..
We have found these views helpful in assessing the sea state. As mentioned, whenever practical we keep each monitor dedicated to a single window. But the large screens make multi-window displays much more palatable in our opinion. Above we have a local chart with sonar strip on top. Our seated views are now as good or better than before when standing. This is console number eight that we have tested. It has all of the controls normally spread out across the width of the Matrix deck. They can all be reached from either helm chair. There are steering controls in each corner of the console. Locally fused and switched items are on the port side, with overhead light switches opposite. 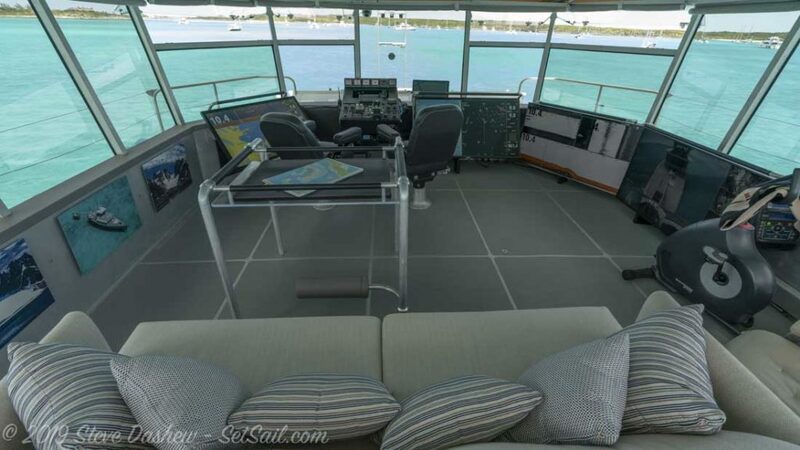 The aft face has the emergency steering control, AIS head, and VHF. The revised Matrix deck has several other new features. We have come up with a combination table, staple rail, and chart table assembly that does a number of things at once. Most important, it is a brace/handrail to use when walking forward from the stairs to the helm chairs. It provides a place to stand behind the helm chairs and be held in place between the staple rails. When you are getting up from or sitting down onto the sofa it helps to keep your body under control and makes sitting/standing a lot easier. The foam wedges are wonderfully comfortable on our feet. In cold weather there are three heater duct pipes behind the TV ready to jump into action warming our feet. 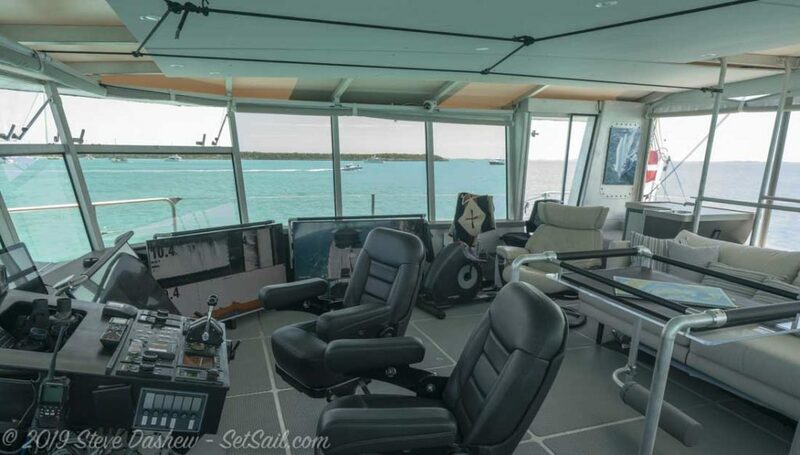 We have our recumbent bike for exercise when we are on watch offshore, with a good view of three of the TVs. The bottom line is that we now have better sight lines, monitor glare on the inside of the windows has been eliminated improving night vision. 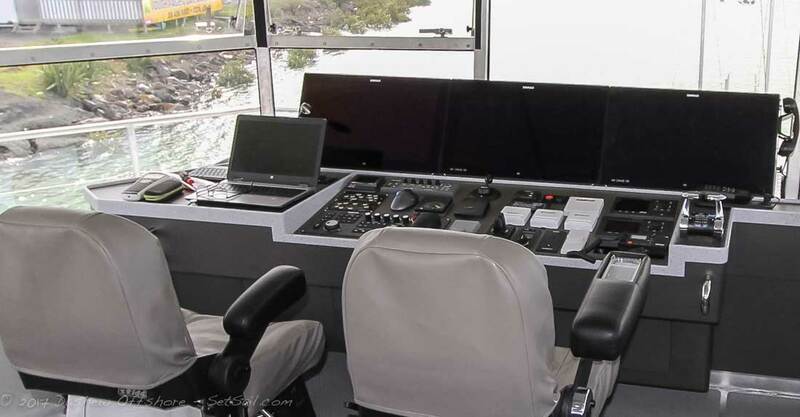 We can operate Cochise seated, and moving around at sea is safer. In the very worst weather if we want to be really close to the windows we can do so more easily than before. This entry was posted on Sunday, March 31st, 2019 at 11:33 pm and is filed under Dashew Logs, FPB 70, FPB Series Notes, The Logs. Both comments and pings are currently closed. 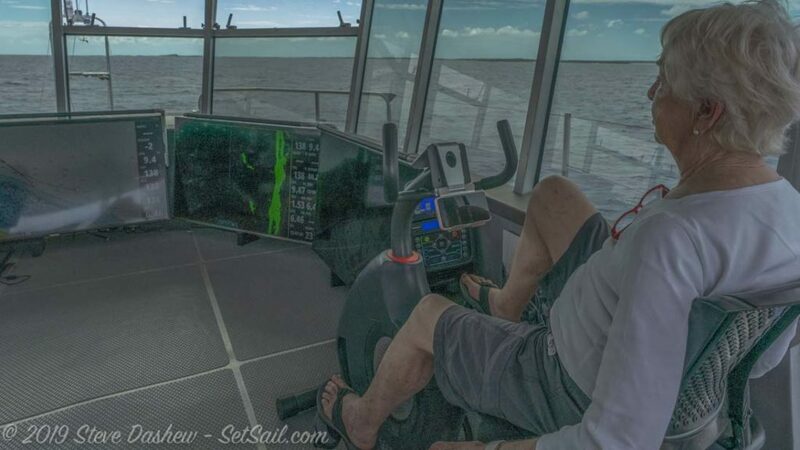 Would the new ‘regime’ also work for sail boats, or is it optimized use in motor boats with an enclosed pilot house? Is it “simply” about have appropriately angled large displays with the desired information, instead of having many tiny instruments only displaying on bit of information? I would say the key take away is to keep instruments as near vertical as can be seen. 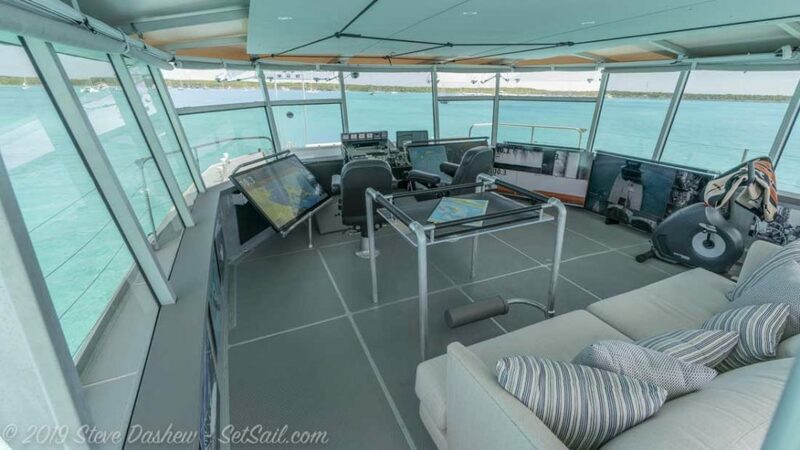 But given ergonomics, viewing angles, and typical sailboat dodger design that’s about it. Agree except we find the fixed units too restricted in use. 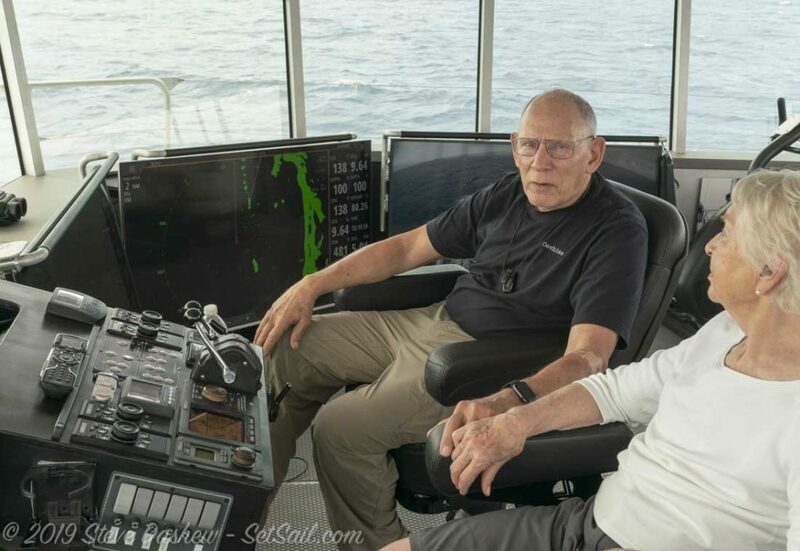 For our purposes the trackballs have worked on our knees or on a table placed beside or between helm chairs. The long awaited post has not been disappointing. 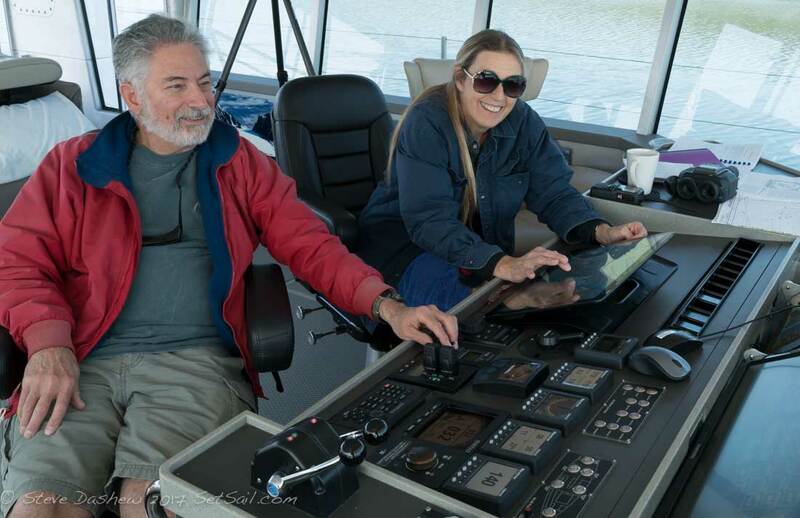 I can this being an instigator for future bridge and helm station designs across the industry. again, thank you for sharing with great updates. now go and have some fun kids, cruise away, and please, please send the occasional picture or seven. Thank you for this interesting post and congratulations on your achievement. With respect to the stability comment, you mention that the Matrix upgrade had the largest impact. Was there a very large weight reduction aloft? Could you provide a bit more detail on this and the other weight redistribution improvements? Weight and vertical center of gravity we feel an be summed up by the philosophy of taking are of the little things and the big items will follow. One of the areas we worked on was the position of our payload. We gained significant benefits by restowing forepeak and workshop. We also moved heat room stores lower. On the Matrix deck we removed heavy furniture, both fixed and movable. We picked up more by reducing the printed nav info carried high. Super cool. Kind of looks like tesla/spacex designed it. I bet y’all spend a lot of time up there.